1.Automation of dumpling making machine; Dumplings forming characteristics, dual-control, two-way synchronization dosing principle, it do not need another noodle production.Just put the dough into the specified entrance boot, it will automatically make dumplings. 2.Adjustable of dumpling making machine; Fillings volume and dough thickness are just adjustable. Also,when making pellicle dumplings, it will save both time and labor. 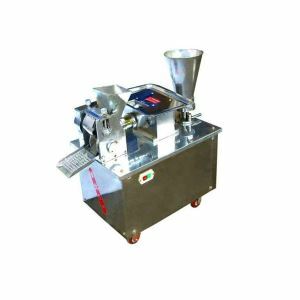 3.Multifunctions of dumpling making machine; Only by simply adjusting the mold, it can change into different shapes, and different kinds of pasta foods, such as: dumplings, pot stickers, samosa, ravioli, empanada, etc. 1.Good design of structure. Making dumplings automatically. 2.High working efficiency, it equals to 8-12 workers'working capacity. 3.Low invest and high return. 4.Easy to operate,it can be easily controlled the thickness and stuffing quantity of dumplings. 5.It is made of stainless steel.So it has a long use life, and also easy to clean. 6.If you possess a dumpling machine, the tough work of making dumplings will completely be easy.